MGM Dizzee world was started by M.G.Muthu group, it is one of the biggest and famous amusement park in Chennai located in the East coastal road which is about 30 kilometers away from the city. The blue scenic of the beach gives a great view of the MGM Dizzee world. MGM Dizzee world serves to be the best entertainer for all the age groups. It is one of the most visited places by children as they love the rides and water games in the amusement park. MGM Dizzee world is designed with Italian architecture spread along lush greenery that is truly a treat for the eyes. MGM takes the pride of many firsts. They were the first to launch Jurong’s bird show of Singapore(in the year of 1999), hot air balloon(in the year of 1998) for the first time in Chennai. You can have many scintillating experiences in this amusement park as there are various rides offered. This is truly a value for money that gives the best experience for the people of all ages. The rides are categorized based on the ages, there are different rides for adults, children and for the entire family. The adult rides consists of many thrilling rides that makes you skip the heartbeat. Some of the best adult rides are the Big wheel, disco saucer, Roll ‘o’ Roll, rolling thunder, star wheel, water coster. You can have a splendid time on this rides and enjoy to the core. There are many rides for the children. Some to name out are- elephant safari, Jurassic train, kids swing, mini jet, mushroom house, rocket tower, tora spin, granny bug and so on. I would definitely say that you will have a tough time to get the kids out of the each ride. MGM offers many rides for the family to have fun together, it is always entertaining to have fun as a gang. There are many family rides in MGM. Carousal, Rainbow, Sky glider, swimming pool, twister are some of the thrilling family rides. You can also have a great time in china kutrallam, rain tree, wave pool, boating, and tree house. You can get into these as a family so have the utmost fun. The amusement park is open on all the days. It is usually crowded on weekends, public holidays and during the summer vacation. MGM Dizzee world is a true value for money and the best place for the kids and adults. It is the best place to visit in the summer holidays as the swimming pool gives us a great relief from the scorching sun. They mainly focus on the customer safety and hence it is mandatory to follow the rules and regulations of the amusement park. They have very cleanly maintained restrooms and river pools that are cleaned very often. The other attraction of MGM group is the MGM resort which is truly a mind blowing place to stay for a day or two. MGM resort is one of the best place located on the shores of the blue sea that gives you a great scenic and gets you out from the stress. They provide rooms for the stay inside the resort that are really high class and has many indoor and outdoor games. You can have a good time playing on the green lush grounds and open area. If you are looking for a quality time with your family to have fun and chill out from the usual routine, then MGM resort and amusement park is the best place that is worth the money and very budget friendly. MGM theme park has really a very good secured parking facility. It is just located opposite to the entrance. It has washroom facilities too. According to their website, it can accommodate 500 cars, 50 buses and 750 two wheelers. Is it not more than enough? MGM has a very large space for the cafeteria. It has two main restaurants. One is vegetarian restaurant that can accommodate 500 people at a time. Another one is themed multi cuisine restaurant which can accommodate 300 people at a time. There are 2 different MGM theme park entry fees - ticket rates. One is called Jumbo Package ADULT. The ticket rate is Rs.649. Another one is called Jumbo Package CHILD. The ticket rate is Rs.549. This MGM Dizzee world entry fee includes all rides and water park. From time to time, there will be offers and promotions available in MGM theme park. For example, below is the MGM theme park promotional offer provided on the occasion of EID. EID Combo offer - Rs.699 per person including MGM entry ticket fee, biryani, and coke. Also, you can save more by booking tickets online. For example, the website Nearbuy.com might have an offer for MGM entry fee. When I checked last time, they had the below offer. Rs.40 to get 35% off on entry ticket. Is it not a nice discount? You can check whether they have any offer before you visit MGM Dizzee world and purchasing tickets directly. Link to check - here. Important Note - Please read the terms and conditions carefully before availing such discount offers and purchasing coupon codes. If you are thinking about spending a valuable time in a theme park, MGM theme park is really a good option. Since it has many rides for kids too, your whole family will surely enjoy. If you are located in the main Chennai city area or in the North Chennai, you need to plan early so that you can spend the whole day there. 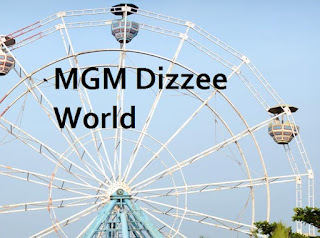 Hope you find the post MGM Dizzee World - MGM Theme Park Chennai Review, Timings, Ticket Rate, Entry Fees useful for you. Please share your experience with us when you visit MGM theme park.